Meet Mickey. We got acquainted just a few days ago. 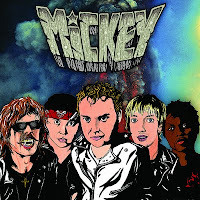 I'm really glad we did because being with Mickey makes me feel like I'm in some dark, sleazy, beer-drenched rock club circa 1977, which is pretty damn amazing. Anyone or anything that can instantly timewarp me back into what seemed a much more dangerous and exciting time in rock and roll is just fine by me. 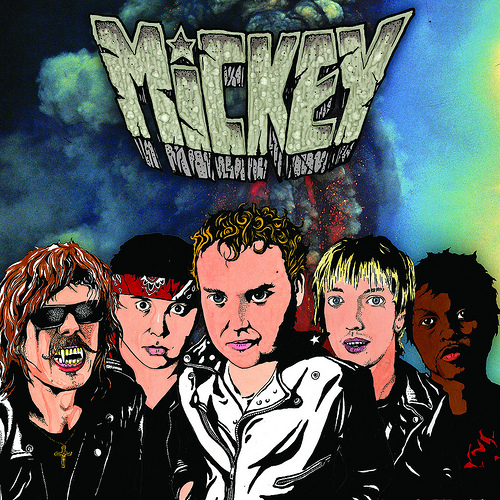 Specifically, Mickey is five guys from here in Chicago who have just released a debut record titled Rock N' Roll Dreamer on Hozac Records. The LP is a revved-up glam-garage hybrid over 10 tracks and about 28 minutes, packed with enough raucous energy and buzz-saw guitar to make you want to jump up and thrash around uncontrollably wherever you are. Mickey doesn't come with any gimmicks. As soon as opening track "Dance" (a tune that wouldn't sound out of place on a Ramones record) begins, it's clear that Rock N' Roll Dreamer isn't bent on doing anything other than rocking out. All of the nine tracks that follow adhere to pretty much the same formula-- straightforward and hard-edged with thoroughly shoutable lyrics, brief runtimes and guitar hooks that grab you by the throat. If you've ever found yourself screaming along to anything by the New York Dolls or The Sweet, chances are this stuff will hit the spot. At times, slight cracks show in the band's jagged exterior to hint at an affection for the more melodic sounds of '60s girl-group; tame the guitar, a few of the lyrics and the madman vocal style, and parts of tunes such as "For You" and "Baby We're Gold" could have easily been performed by The Ronettes. Then there's manic frontman Mac Blackout, who deserves special mention for sounding like he's either on the road to a nervous breakdown or already there. His vocals almost straightaway made me think of Eugene Reynolds of classic British punk band The Rezillos, which is a very good thing. He comes across like the kind of guy you might be a bit scared to meet for fear of him randomly losing it at any time, which plays a major part in shaping the gigantic personality of Mickey's sound. Not much more can be said about this record; it's just good old fashioned, wonderfully seedy, enormously fun rock and roll. It's not an album that's going to make you think deep thoughts or change your life, and thank God, because who couldn't use a break from that sort of thing? If you dig anything in the realm of glam, punk or garage rock, give this one a try. Mickey'll show you a good time.